A note arrives from Fernando Nicholson at Camper & Nicholsons in Fort Lauderdale to say that he and Rick Morales have signed the central agency for sale of the 35m motor yacht Moon Goddess. Moon Goddess, built by Danish Yachts in 2006, is an exquisite custom carbon fibre open sports yacht styled by Espen Oeino. 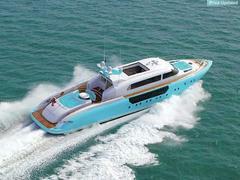 Her Francois Zuretti interior sleeps six guests in a full beam master suite and two twin cabins. This superyacht is powered by twin MTU 4000 series engines driving twin Hamilton water jets giving speeds up to 43 knots and excellent maneuverability. Also available for charter through CNI, Moon Goddess is priced at $9 million.